Project Perfect Mod :: View topic - Can we get a remap changer? Can we get a remap changer? Posted: Sat Jan 16, 2016 5:55 pm Post subject: Can we get a remap changer? So that when editing (fixing) remaps and errant red shades, it can be easy to see which is or is not a remap red, by changing the remap to something starkly contrasting to red. 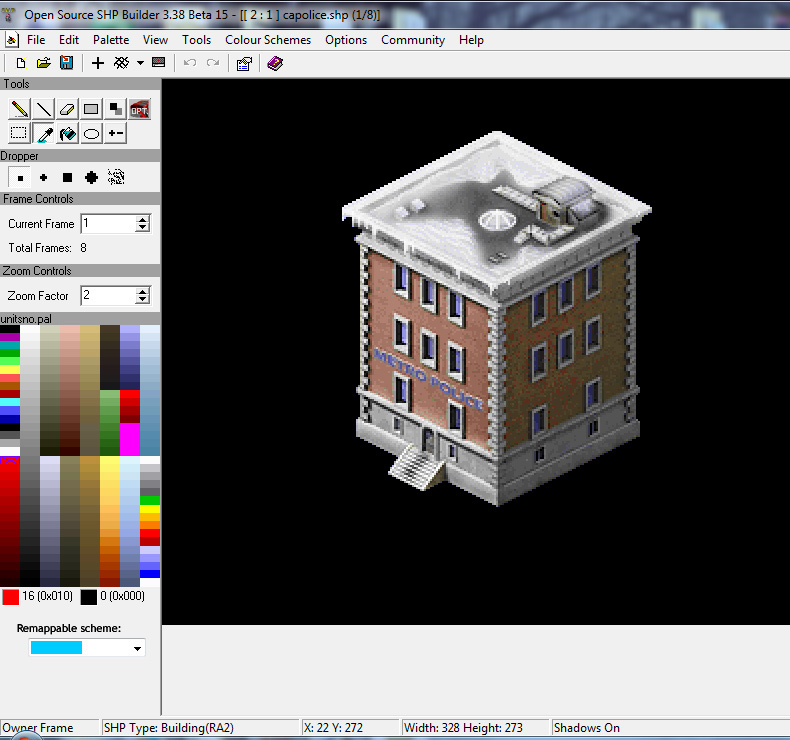 I've been working on a lot of pinkish and reddish buildings, and it's not as simple as replacing a specific colour with another, since that colour will appear elsewhere in the non-remap areas too. Since we only need 16 shades for the remap substitution, perhaps include a extra remap-switch palette file, and use each block of 16 colours as an option in the dropdown, using the first of each 16 as the selector. That way we can edit that .pal to whatever alternate shades we like should we need to. Good alternate colour sets would be: lime, purple, turquoise... and other inbetween colours. Well then as you already pointed out you can edit the pal, you can surely do it all by yourself now with your desired choice of color and add it to the palette list for quick switch. Perhaps supply it for Banshee for inclusion but I don't think he is too keen on adding separate option for such small feature. Alternatively you should adapt to using conversion palettes that avoid mix-up in first place and saves you the effort in fixing them. It's more the fact that when I'm doing touchups, I like to do a range of things at once, and possibly not knowing ahead of time which palette would work best. I mostly use photoshop, but sometimes SHP Builder is more apt, and this feature could save several switches. You can change the remaps in the preview, you can customize your palette, you can do a lot of things. I don't really think it is worth to pollute the layout of the program with this option, to be very honest with you. You also have a ton of room on the toolbar if you don't like the left column?